John Cole heard about the Helping Communities Grow program for FFA chapters and thought, “my students would enjoy that.” Little did he know, deciding to participate in the competition would lead to reconnecting with a classmate from over 40 years ago and so, so much more. Mr. Cole, agri-science and career exploration teacher, kindly took the time to share Richardson Middle School’s experience with their first school garden and how a few rows of potatoes changed so many lives. Tell us about your background with soil science, nutrients, and gardening. My grandfather started a “general store” in 1905. It sold everything! My family worked in the store and I grew up working in it. We sold seed, fertilizer, pesticides, gardening tools as well as groceries, hardware, farm supplies and “dry goods!” We also had a 600 acre working farm. We grew crops, gardened and raised livestock that we sold and also butchered to sell in the store. I know retail, wholesale and the production aspect of growing food. Since I had this background I was involved in agriculture and FFA in high school. My first semester of college was paid for by a “pea patch!” We usually planted 30 to 50 acres of rye, millet seasonal and 100 acres of corn, plus our own personal garden. Why did you decide to start a school garden? I got an email from Joan Kyle through FFA about the Helping Communities Grow competition. I read it and thought that my students could do it. I thought my students would enjoy it and become involved. What were the first steps in making the garden a reality? First we had to figure out where we could plant on campus. Our school is an inner-city school so all that was available was a ¼ acre. Then I needed to find a corporate sponsor for supplies and figure out how to get the land cultivated. The land has been used to dump grass clippings, limbs, and some junk! My classes cleaned the land of the junk, limbs, and other debris. I mentioned to my classes about getting the land tilled. One of my students mentioned that her grandfather would do it and for me to call him. Her grandfather was a fellow classmate of mine and FFA member. We had not seen each other in over 40 years. He came and tilled the grown with a tiller that worked off of a tractor. What did you grow and how did you choose that plant? I needed to grow something that was “user friendly” and could be worked during school time. So I decided to grow potatoes. I had grown potatoes 30 years ago and I felt that they would be something that the children could engage in. We planted 50 pounds on 7 rows and harvested 150 pounds. How did you expand the learning opportunities in and outside of the garden? The Nutrients for Life curriculum is awesome and is easy to teach and very practical. The great part of the curriculum is that I can teach it and then go out to the garden and apply the knowledge. What was your experience working with other teachers, students, and parents? Our whole faculty and staff got involved through support and interest. Some of the science classes always came out to checked on it. I think some of my students pestered their science teachers so much that they gave in and let my student share their experiences as they toured the “Potato Patch.” We even had some of the county employees come by periodically just to look at the potatoes growing. How did you introduce the topic of soil health and nutrients to your students? By using the Nutrients for Life curriculum and the Agri-Science text book, as well as the use of technology and videos, I taught the students how to properly protect and utilize our soil. Also nothing beats a “hands on or hands dirty” application. What were the biggest difficulties with your school garden? 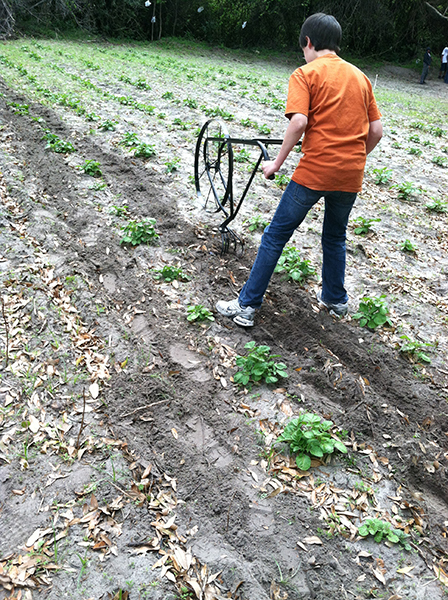 There was no equipment so we used an old fashioned hand plow, hand cultivated it, hand watered it and hand fertilized it. We also had a deer problem. I was told to hang plastic bags from trees surrounding the garden but that did not work. How did you see the students change as they spent time in the garden? How did this influence you? My students really got engaged. 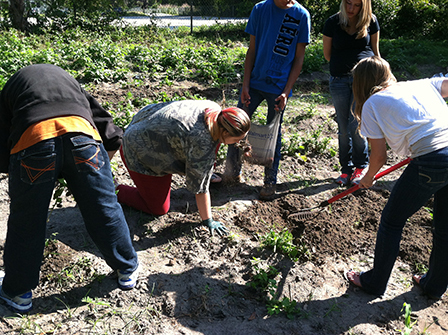 At first it was only a few that wanted to do the work, but as the weeks progressed almost all of the students took part in the “potato patch!” By the time of harvesting, they all wanted to be involved. We included the special needs classes. They helped plow, plant, and water, fertilize, cultivate and harvest the patch. I changed by watching and modeling for my students. One thing that was funny is when there was plowing to be done and I would start to do it, the children didn’t want me to do too much so they would take the plow from me. Most importantly I saw how the children “owned the potato patch.” It truly became theirs and they really enjoyed it. It was good for them to have to farm it like it was done in the olden days…all by hand. What was the greatest moment for you in the garden? Our school is in the 80%+ level of free or reduced lunch. Last year we had on average 10 students that took backpacks of food home every Friday because the only meals they sometimes have are the ones at school. The FFA chapter took this as a project and procured the food and packed the bags every Friday. Four of the students that were in the classes that grew the potatoes got backpacks on Fridays. Our goal was to send potatoes home with these students. We sent bags of potatoes home two Fridays. The first Friday when those students picked up their backpack and bag of potatoes it was an experience. The children that get the backpacks are kept a secret so as not to embarrass them. But that Friday these four carried their bags of potatoes and showed every student they could find. The look on their little faces said, “Look, I know how I can feed my family.” I will forever remember the look of confidence and sheer joy that those children had. The next Friday as they had their second bag they told every student they could about how good the potatoes tasted. Who would have ever thought how much 7 rows of potatoes would change all of our lives. What would you advise to anyone hoping to start a garden or become involved with a garden at their local school? Get and use the Nutrients for Life curriculum and get dirty! If you had one, what would your gardening motto be? You are amazing !!!!! Thank you for all you do for the children !!! Way to go, John. We are proud of you. Keep up the good work!!! Grow something good again, since I’m retired I need some “reasonably priced ” vegetables!!!!! This is an excellent article highlighting our students skills. 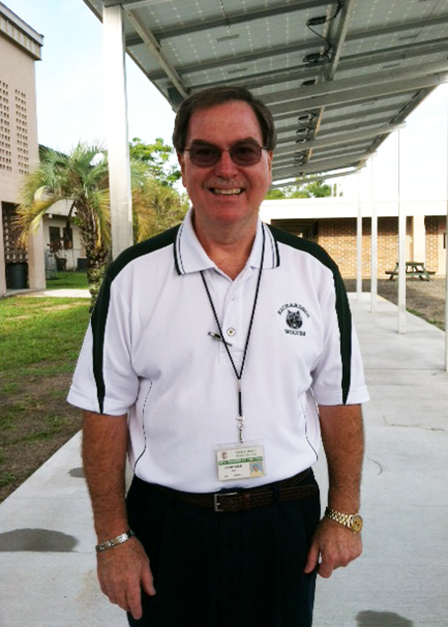 Thank you Mr. Cole for being a great facilitator. Great Job! 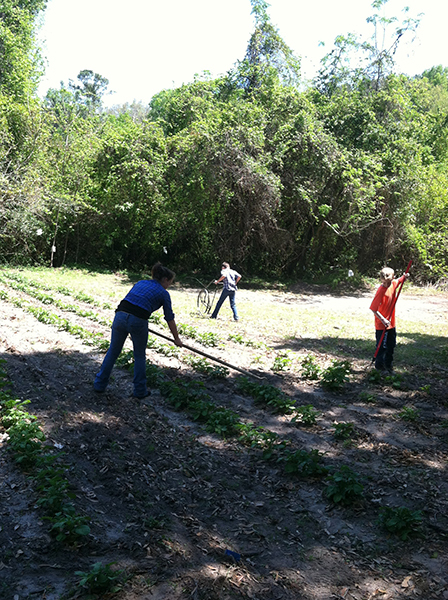 The students are hard at work and look like they are really enjoying gardening. May you continue to impart all of your knowledge to help students learn and grow. Very, very nice! !The students will remember this the rest of their life! Mr. Cole, a special thanks for putting this idea into a “real life” project. 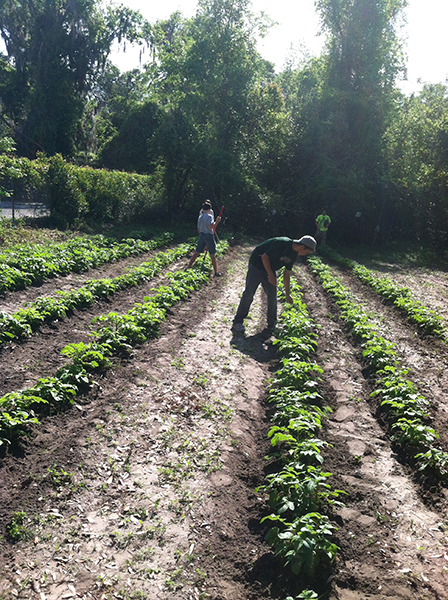 Here is my critical thinking question for the students….Having grown this potato garden, think about how many french fries are sold each day at every fast food establishment in America. How many potatoes are grown each year and how are the stored so that fresh potatoes are available to consumers? Way to go Mr. Cole. My son, Gage, loves your class and all that you teach them. He talks about you all the time. Thanks for all you do! Amazing! Mr. Cole I knew the first time you told me about your plans with your class it would be a success. I love gardening myself and know the important life lessons associated with it. The students will forever remember the lessons instilled because of your class. Great job to you and your students for all the hard work. As you say Mr. Cole your class / program is one of the best kept secrets in town! We are proud of you and your students. Thanks for spreading the word and making Agriscience class exciting and beneficial.